212 pages | 88 B/W Illus. In recent years, the use of illegally produced firearms has increased exponentially worldwide. These are often cheap, nonstandard firearms that defy known classification and identification criteria. The use of unusual firearms in crimes has frequently led to unpredictable and misleading reconstruction of shooting incidents. 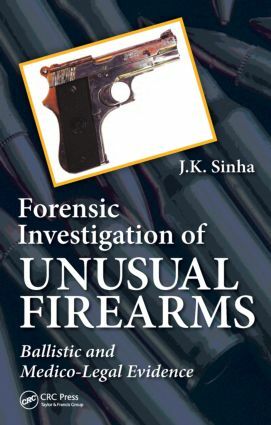 In this book, internationally known forensic firearm expert, J.K. Sinha, presents a detailed forensic study of unusual firearms, with the goal of helping crime-scene investigators to minimize erroneous conclusions in cases where these types of firearms are used. Based on his extensive experimentation with more than 1,000 nonstandard firearms, the author identifies new class characteristic parameters needed to establish linkage of projectiles with irregular rifled and smoothbore barrels. The book begins with an introduction to unusual firearms and proceeds to discuss forensic investigation of fired bullets, medico-legal evidence, barrel marks on fired shots, and investigation of fired cartridges and shot charge. Chapters also cover topics such as timing of firing, unusual rifling marks, shooter identification, and unusual bullet hole evaluations. Providing concise yet complete techniques for making forensic analyses and conclusions, this is the first book of its kind to critically examine the use of unusual, nonstandard firearms in perpetrating crimes. It is intended for professionals and academicians working in the field: forensic firearm experts and consultants, forensic medicine professionals and medico-legal experts, prosecution and defense attorneys, enforcement agencies and judiciary, university students and researchers studying forensic science, forensic medicine, criminology and law. J.K. Sinha received his PhD degree in forensic science. He has been associated with this field for more than half a century. An internationally known, forensic firearm consultant, he has been a firearm examiner of the federal/central government for 34 years and has served as Director-Incharge and Deputy Director (ballistics) of Central Forensic Laboratory, Chandigarh, India. He has examined more than 5,000 firearm cases and has testified in hundreds of courts as prosecution, defense, and court witness. His testimony on significant forensic issues can be found in law journals of court judgments, and referred to as case law by practicing attorneys/lawyers in India. Dr. Sinha has been actively engaged in university teaching and research in forensic science. He has supervised successful PhD candidates on topics related to forensic ballistics and explosives. His area of research revolved around case-oriented practical problems and development of innovative identification techniques. He has published several papers in India and abroad. He has added new dimensions in the little-known and unsolvable area of illegally made firearms. His popular web page on forensic firearm and unusual forensic ballistics (www.forensicfirearmidentification.com) ranks among the top five in almost all popular search engines, directories, and metacrawlers. He had been the editor of the forensic firearm category of the open directory project of Netscape (popular web browser). Some of his published papers and unpublished work on evaluation of unusual, evidentiary clues detailed in his web site are cited and referenced by many popular forensic firearm sites, online educational institutes, manuals and books on forensic firearm, and forensic medicine.